Our printed pleated blinds really are a market first. 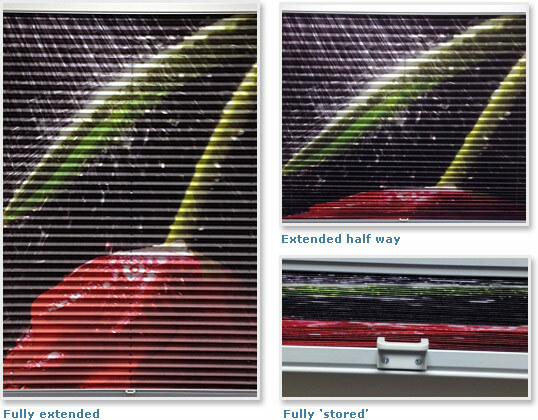 Easy to clean and contemporary in style, pleated blinds, printed with an image of your choice from our extensive online Image Gallery or from your own photographic collection, will make a real statement at your window. Perfect for all window shapes and sizes, including conservatory windows and garden rooms, our designer pleated blinds are made to your exact specification. Fabric is available as 100% Polyester, or 100% Polyester with fire-retardant, dim-out and solar-reflective properties, and offers a soft shading effect, with a minimal stack height when the blind is open, facilitating greater light control during the day. In addition, they are fitted with the Equipleat system, ensuring that the blind will hold its pleats well and not sag. Our PerfectFit Pleated blinds are particularly suitable for children’s rooms, as there is no cord attached, which makes them very safe.